Fairmont St Andrews has two exceptional courses that hug Scotland’s dramatic coastline – the new Kittocks course (previously the Devlin) and the Torrance course. The signature Fairmont Spa is on grounds and available. This prestigious five-star hotel has 144 rooms including 35 suites and is recognized as one of Europe’s leading resorts. This fine resort hotel overlooks the manicured acres of its namesake Old Course and across to the sea beyond. It’s an elegantly informal haven of luxury, warm hospitality and exquisite dining. The absolute best Scotland has to offer. 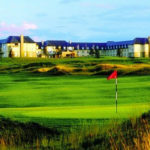 The Macdonald Rusacks Hotel in St Andrews is,without doubt one of the most famous golf hotels in the world. Overlooking the 18th hole on the world-renowned Old Course, Rusacks combines luxurious accommodation with a front row seat on sporting history. The award-winning Rocca Bar & Grill serves the finest food and drink against a backdrop of the world’s most photographed golf course. Magnificent views out to sea take in St Andrews’ West Sands, immortalized in the opening scenes of the Oscar winning film, Chariots of Fire. Accommodations for designated USJT programs will be at New Hall on the campus of the University of St. Andrews. This facility has been personally selected for comfort, safety, and proximity to the golf courses. St. Andrews is the oldest university in Scotland, and third oldest university in the United Kingdom. Nestled in the city of St. Andrews, the university was founded in 1413 and boasts a lovely and charming setting. Golfers and family members will be housed in New Hall and have access to the entire campus as well as all athletic and leisure facilities. 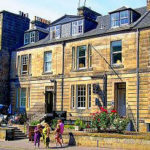 The city square is a mere 5-minute walk with access to shopping, historical attractions, and many ethnic restaurants.This lovely and practical facility has been our home in Scotland for all programs over the past five years. Whether sightseeing in Fife, playing the St. Andrews Links Courses or cheering at a tournament event, this property is one of the most unique in all of Scotland. 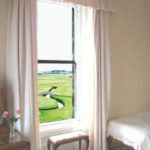 It is situated only a few yards from the notorious 17th Road Hole of the Old Course and has a fantastic view of the Old Course and the North Sea. Positioned on the corner of the world famous St. Andrews Links, your neighbors will be the Tom Morris Golf Shop, and The Royal and Ancient Members Club. Each morning one awakens to the sight of the Swilcan Bridge. This breathless sight and accommodation is truly one of a kind. The entire apartment is fully furnished. The living room, brightly and beautifully decorated, has a fantastic panoramic view of the Old Course and The North Sea. It features a fireplace; three seat settee, and wide screen television. It is the closest one can get to The Old Course and still be indoors. The flat has a fully equipped kitchen and bathroom with shower. The End House may be the most unique property in St. Andrews to be available to the private sector. As one stands in the sitting room, The Old Course appears like a movie through the large living room windows and it is hard to believe the course sits right outside. The St. Andrews Shuttle will drop you at any of the Links Courses as well as the Practice Centre. The charming owners live onsite in an adjoining flat, totally separate from guests. 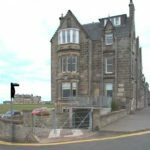 Centrally located within St Andrews, on North Street, 200 yards from the world famous Old Course and R&A building the Ardgowan hotel is also near the town centre and the University of St Andrews. The Ardgowan comprises of two adjoining Georgian Houses of architectural note designed by the famous Scottish Architect Sir William Playfair. 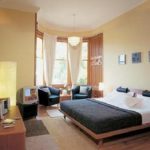 The Ardgowan offers twenty nine comfortable ensuite bedrooms all recently refurbished to a very high standard. On the ground floor of the hotel is Playfair’s, a well known Scottish restaurant and lounge bar where a wide variety of freshly prepared food is freshly prepared. St. Andrews Golfing Lodge is a rare alternative to the ‘hotel experience’. This concept is becoming increasingly popular for the golfers or travelers looking to supplement the golf trip of their lives with luxury and first class accommodations. This unique lodge is the first property in the St. Andrews area to offer a 5-star exclusive use destination for groups, golfers, friends and families. The lodge can be booked nightly and is perfect for 8, but can easily accommodate up to 12 guests. Each group has the lodge to itself – no strangers, no sharing, and with 3,500 sq. ft. it is extremely spacious. There plenty of off street parking included and this bodes well as St. Andrews was not designed for cars. Each of the 5 bedrooms can be configured for singles, doubles, or twins and 2 of the bedrooms can be triples. 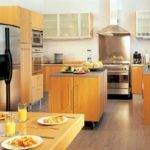 Guests can book on a catered basis that includes breakfast or book non-catering and have full use of the gourmet kitchen. A chef can be arranged for evening dinner or to deliver pre-prepared meals. I have visited this facility and have had the opportunity to meet the owners who are also the managers. They have included everything imaginable to make your stay a luxurious one. St. Andrews Golfing Lodge exceeds the highest expectations and I have never seen a property like this anywhere in the world! 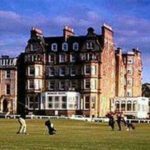 The Roxburghe Hotel in Edinburgh’s city centre is the ideal destination for anyone looking to stay in Edinburgh to catch an early flight or play golf in the East Lothians. Only 7 miles from Edinburgh airport and less than a mile to Waverly Train Station walking is easy to all city centre attractions and world class shopping spots. Please contact us for information on additional accommodation options. Never lose a golf club again. "Take a Mulligan!"